You sure couldn’t gauge the state of the global economy by the buzz generated last October at EuroBlech 2008, for this was another record-breaking show, marking the 20th edition of the International Sheet Metal Working Technology Exhibition. Held October 21-25 in Hanover, Germany, EuroBlech2008 registered an increase of 8 percent for exhibitors and attendees over the 2006 edition. The show’s machine displays consumed an exhibition area of 87,700 sq. m, up 15 percent from the 2006 show, and nearly 70,000 visitors explored the booths of 1520 exhibitors representing 38 countries; 35 percent of those visitors came from outside Germany. Show organizer Mack Brooks Exhibitions also noted an above-average increase in the number of attendees from the United States. What follows are just a handful of the new-technology highlights gathered from walking the floor of the numerous exhibit halls of the city within a city that is EuroBlech. We’ll have more in coming issues of MetalForming. And, plan now to attend the next edition of EuroBlech, October 26-30, 2010. The enormous Amada booth featured several new machines, including the LC-F1NT series of high-speed laser-cutting machines boasting linear drives in the x, y and z axes. With power options to 6 kW, the machine salso feature water-assisted cutting and twin-adaptive lens technology to eliminate the need to change lenses based on material thickness. I viewed a demonstration at the booth, cutting 0.8-mm aluminum and 6-mm steel with the same lens. 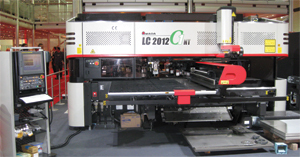 Also introduced at the show was Amada’s new entry into the laser-punch combination machine market, the LC2012 C1 NT (pictured), which we’re told will be introduced to the U.S. market later this year. Touted as the firm’s first small-format hybrid machine—the laser moves in one axis while the sheetmetal workpiece moves in the other axis—it features a 45-station turret and offers a 12-mm form height. Compared to previous machines, we’re also told that the LC2012 C1NT offers improved accuracy—±0.07 mm vs. 0.1 mm. Dura Punch tooling—punches and retainers in a variety of shapesand in inch and metric sizes—highlighted the stand of Moeller Manufacturing Co.Designed for heavy-duty work, the punches boast a thicker head, a radiused transition and a chamfer on the head to better distribute forces and minimize the likelihood of breaking. Models include solid or ejector with standard point or reduced shank, and retainers for round or shaped punches. Also available: shoulder and reduced-shank punch blanks. 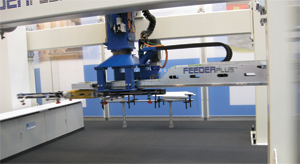 Ideal to automate new press lines or to retrofit and upgrade existing lines, the FeederPlus linear robot combines the benefits of linear and articulated robots by carrying out linear moves yet offering rotational axes to orient parts during transfer between presses. Speed maxes out at 12 largeparts/min. Two models are available—an 80-kg-payload model with minimum gap between presses of 5500 mm; and a 120-kg model with minimum gap of 6500 mm. Max gap between presses or both models is 11,000 mm. Position repeatability is ±1mm. Tooling connection is either crossbar with saddle or adapter for robotic tooling. A 60-ton 50-in.-bed Model BSTA 510-125 high-speed press starred in the Bruderer stand. Compared to the previous model, the BSTA 500-110, the new press offers an extra 7 in. of bed length. This allows for higher bending moments and more room for die stations. Bruderer designed the press to allow for minimized bending strain and to increase the ram’s resistance to tilt. Maximum press speed: 1050 strokes/min. LVD made a huge splash at EuroBlech with its largest stand ever, showcasing new concepts in press-brake, laser and punch-press automation and, for bending particularly thick and hard materials, its new Easy-Form 200 adaptive forming system for plate as thick as 30 mm. LVD has focused on mid-level automation, company representatives say, where there is an optimum trade-off between automation and cost. It also has begun to integrate more and more standard robots into its fabricating machines. 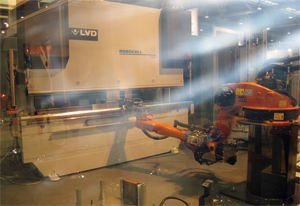 A good example of this philosophy, on display at the exhibition, is the Robocell (pictured), a compact automated bending cell for small and medium-sized components that combines an LVD PPEB press brake with a Kuka handling robot. The press brake is mounted at a normal operating height and the robot is placed 2 m from the bend line to allow unhindered access should a fabricator wish to operate the press brake manually. The cell would typically include two input stations, a centering table, a regripping station and two output stations. LVD also offers robots to automate loading and unloading of punch presses. At EuroBlech it displayed its Pick-Sort system that uses a Kuka robot to turn a Strippit V-series machine into an automated punching system. In contrast to other pick-and-place automation systems, the pick-Sort carefully places parts onto a stack rather than dropping them. Also new for EuroBlech: the Strippit LP-1225 laser-punch combination machine; and LVD’s latest addition to its Axel series laser cutting machines, the Axel 4020. Modularity and global sourcing of components—that’s what customers asked for when Schuler surveyed them when developing its new Power Feed coil-feeding system. Among key features are the use of servo direct drives and low-clearance maintenance-free planetary gears. Customers can select among three models based on coil weight capacity, and can then, based on changing needs in the pressroom, retrofit to upgrade capacity. Due to the modular design of the feeder, even maximum coil width can be adapted to suit customer needs. Amongst the bevy of booths showcasing cutting and welding equipment was that of Thermadyne, which introduced its Ultra-Cut 300 family of cutting systems under the Thermal Dynamics brand. Ultra-Cut setups combine an inverter power supply, a new gas-flow management system and the XT-300 torch.Visitors to the stand witnessed the new XT-300 robotic-cutting torch. Auto-Cutsystems are available with 100-, 200- and 300-A capacity. Thermadyne also introduced its Cutmaster A-series compressed-air plasma-cutting machines for mechanized cutting; and Cutmaster True series of six manual air-plasma cutting machines with the ATC (AdvancedTorch Connector) quick-connect system. Salvagnini America introduced a new generation of its S4 punch-shear combination machine—the Salvagnini S4X, promising enhanced flexibility, accuracy, energy conservation and productivity. The X-seriesmachine features a completely redesigned manipulator powered by two pairs of rotary electric motors. The first pair employs rack-and-pinion kinematics while the second pair uses two ball-bearing screws to position the sheet. The new manipulator enables the S4X to offer increased processing speed, reduced cycle times, and increased productivity and accuracy. All of the S4X’s 96 punching-tool stations are live and ready to simultaneously punch, countersink and emboss parts. And the built-in shear makes cuts of any length. Other major upgrades in the X-series machine include a new hydraulic power pack that reduces power consumption by 30 percent, an optional Cartesian stacker, and the expanded ability to incorporate all types of feeding connections. Salvagnini debuted the S4X along with its P4X panel bender at EuroBlech. We were told that compared to previous models, the new machine soffer as much as a 20 percent increase in speed and cycle time. Following the show, the S4X on display was shipped to Danish manufacturer Expedit; the P4Xwas delivered to the German company Klingenburg, a manufacturer of ventilation systems. 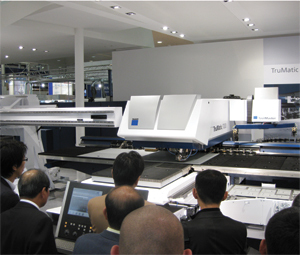 Laser-punch combos seemed to be the star attractions at the booths of fabricating-equipment leaders at EuroBlech, including Trumpf, which introduced to the European marketplace the TruMatic 7000 (pictured). Themachine comes in two sizes—2540 by 1280 mm and 2540 by 1570 mm—with as many as 22 tool stations in the linear magazine, and a 4000-W laser. Due to a newly designed beam-guidance system, the TruMatic 7000 can process sheetmetal in arange of thicknesses using one cutting head. And, an automatic nozzle changer takes care of nozzle exchanges. Maximum sheet thickness: 8-mm mild and stainless steel, 4-mm aluminum. Also anchoring the Trumpf booth was the TruLaser 3030 New,which also features automatic nozzle changing to minimize downtime. Fabricators can install a pallet changer perpendicular to the machine to minimize the overall footprint. And its 5-kW laser resonator has a standby mode that reduces power consumption to just 15 percent of the rated value. See also: Amada North America, Inc, Bruderer Machinery, Inc., Moeller Precision Tool, Salvagnini America, Inc., Schuler Incorporated, , Victor Technologies Group, Inc., TRUMPF Inc., LVD-Strippit, Inc.